What makes HDO Kindercampus King so special? The King Children’s Campus playgroup is located in the Kostverloren district in Amstelveen-Noord. There is an intensive partnership on the Campus of education, playgroup, after school care, lunchtime supervision and childcare. Click here to read about the philosophy of the King Children’s Campus. Children aged between nought and twelve come together on the campus, where the focus lies on the child’s development. 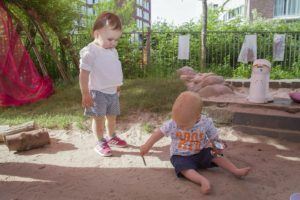 We are housed in a fantastic new school, and KinderRijk actually has four areas in the building, one for the playgroup and three for after school care. Each area is excitingly and imaginatively laid out. Getting your child suitably prepared for primary school without having to switch locations? We provide whole-day care for children aged between 2.5 and 4 at the PeuterKing group. The staff prepare the children for primary school based on active, creative and fun routines. The children explore and discover, practise language, learn how to count and become familiar with standards and values together with their peers. All this is based on the preschooler programme Onderbouwd. Your child will come across the topics from this programme again when it joins the preschoolers, and this will give your child a sense of familiarity. The PeuterKing group is located at the King Children’s Campus together with the school, the half-day care group and after-school care. As the toddler group and the preschooler groups are situated closeby, the toddlers will get a chance to become familiar with the preschooler teachers and they will occasionally do joint activities. This enables the toddlers to gradually become used to school, which is a great help for a smooth transfer. Toddlers at this group therefore have priority with regard to a place at the school. Children can take a rest at the PeuterKing group; there is no separate sleeping accommodation. The PeuterKing group is part of the King Children’s Campus.